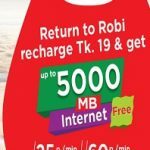 Robi Bondho SIM Offer 6GB Internet! Robi all bondho sim users now are eligible to Robi Bondho SIM Offer 6GB Internet for 6 months. The customers who want to return Robi, they can get this special Internet offer. Customers can get first 1GB data in only Tk 6. If you want to know more about Robi Bondho SIM Offer 2017, just read this full article and get a clear concept. Today I will share for all Robi customers how to process or active Robi 6GB Offer details. Robi 1GB Internet only Tk6 (+all taxes). The pack can be purchased by dialing *8666*060#. The pack can be purchased only once within the validity period. Up to 6 GB can be purchased in 6 months. Now Robi all Bondho SIM customers can get to know more update information about the Robi Bondho SIM Offer 6GB Internet and lowest Call Rate offer details. Have you any question about Robi Bondho SIM Offer 2017, just comments the box. We will answer as soon as possible. Thanks to all customers for being with us.